Grant us to share in thy triumphant fate. And be thyself our guide upon the way. 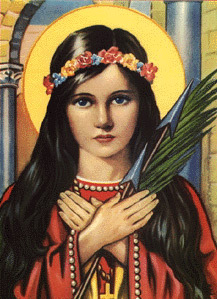 The story of St. Philomena when compared to the stories of other saints is unique. For it is a story of a virgin and martyr of the first century of the Roman Era who had remained for centuries unknown to the world and church. Only upon the disinterment of her tomb in May, 1802 in the ancient catacombs of St. Priscilla in Rome did the Catholic world start to learn about her. The tomb was marked with three titles inscribed with the following words, "Peace be with you, Philomena." Also inscribed on the tiles were several symbols: a lily, arrows, an anchor and a lance, which indicates virginity and martyrdom. Inside the coffin were the bones of a girl of about thirteen years of age, along with a vial of her dried blood. The remains were transferred to the Vatican and stored in the Treasury of the Rare Collection of Christian Antiquity. The public soon forgot the remains, especially since no record existed of a virgin-martyr named Philomena. But in 1805, a Neapolitan priest requested and received the relics so that they could be enshrined in his village church in Mugnano, Italy near Naples. Immediately signal favors and miracles began to be granted through her intercession and unusual events to occur. Thus did the popularity of this unknown saint begin to spread worldwide, so that this virgin-martyr soon earned the title, "Philomena, Powerful with God." The most illustrious miracle attributed to St. Philomena is the miracle associated with Pauline Marie Jaricot. Pauline Marie Jaricot is the Foundress of the Society of the Propagation of the Faith and the Association of the Living Rosary. The cause of her beatification and canonization has been introduced at Rome. She suffered from advanced heart disease and her death was near. In March of 1835, she decided to travel to Rome to seek an audience with the Pope and to get The Holy Fathers' blessing (the ambition of her life) then on to Mugnano, where the relics of St. Philomena were enshrined, in hope of a cure. The Holy Father, Pope Gregory XVI, was informed of her arrival in Rome and went in person to the convent of Trinita dei Mouti which was run by the Order of the Sacred Heart. He came because she was incapable of going to the Vatican. This was an extraordinary honor and an unspeakable consolation to Pauline. The Pope blessed her over and over and thanked her for her work in behalf of the Catholic Church. He then asked her to pray for him when she got to heaven, and Pauline promised. Pauline then spoke to the Pope and these are her time-honored words: "If on my return from Mugnano, I were to come to the Vatican on foot, then would Your Holiness deign to proceed without delay to the final inquiry in the cause of Philomena?" The Pope answered, "Yes, yes my daughter, for that would be a miracle of the first class." Then turning to the Superior of the Sacred Heart nuns, Mere Barat, who was there during the entire interview, he said in Italian: "How ill our daughter is! She seems to me as if she had come forth from the grave. We shall never see her again. She will never return." After a short delay, Pauline and her party set out for Mugnano. They arrived on the eve of the feast of St. Philomena. Many people were there to celebrate the feast and when they learned whom Pauline was and the purpose for her coming, they were greatly excited. They carried her into the church on her reclining chair. Then they knelt at the shrine of St. Philomena and demanded a cure for the girl who had taken such a heroic pilgrimage. The next morning, Pauline received Holy Communion near the shrine with the saint's relics. She then suffered pains through her body and then fainted. The crowds thought that death had taken her, but she recovered consciousness. Suddenly, a flood of hot tears burst from her eyes, color came back to her cheeks and a healthy glow over her limbs. She was filled with celestial joy and she thought she was about to leave this earth for Heaven. But it was not death. St. Philomena had cured her and she was to live many years to toil for God and His church. Pauline then made her way back to Rome to the convent of the nuns of the Sacred Heart. Mother Barat urged Pauline to ask for an audience at the Vatican by appealing through proper channels. The Papal guard admitted her incognito on the advice of a Cardinal and Pauline walked into the audience chamber of the Vatican, knelt before the Pope and she rose at his suggestion before he recognized her. Gregory XVI was startled and asked, "Is this really my daughter?" And has she come back from the grave, or had God manifested in her the power of the virgin-martyr?" Pauline said, "It is the woman you saw at death's door so short a time ago. God has had compassion on me. Thanks to Philomena's prayers. And I want your permission to carry out the vow I made to her at her shrine. I promised I would build a chapel to her in Lyons." "Assuredly," said the Pope. "And we shall now carry out the other promise I made to you to approve the study of her cause. And now I want you to tell me the entire story of your cure." Pauline had to remain in Rome for a year so that her cure could be thoroughly investigated. 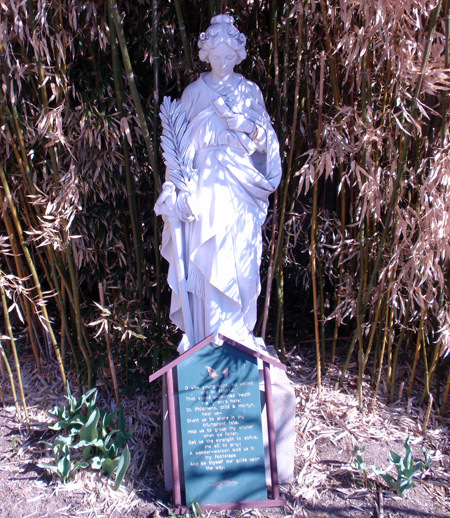 Pope Gregory XVI elevated Philomena to sainthood in 1837, only 35 years after her exhumation. In an act un-precedented in the history of the Catholic Church, she became the only person recognized by the Church as a saint solely on the basis of her powerful intercession, since nothing was known of her except her name and the evidence of her martyrdom. After the canonization of St. Philomena, her fame spread throughout the world. But if a simple humble priest, John Vianney, from Ars, France, had not sounded her praise for the space of thirty years, she would not have enjoyed the immense popularity that became hers. Saint John Vianney, better known as the Cure of Ars, was born in 1786 and died in 1859. After his ordination he served as pastor at Ars, a small village in France, from 1818 until his death. He was canonized by Pius XI in 1925, and in 1929, the same Pope made him the patron saint of parish priests throughout the world. His incorrupt body lies in state over one of the altars in the Basilica at Ars. While he was pastor at Ars, his holiness became known and Ars became a place of pilgrimage. The rich and poor, learned and simple, good and bad, lay people and religious all came to Ars. They primarily came to kneel before this saint in the confessional where he had the authority of holiness. The Cure possessed the supernatural gift of reading the minds and hearts of many of the troubled penitents who were seeking guidance from this humble priest. The Cure of Ars also had the gift of bodily healing, and many of the pilgrims came to Ars to request miracles. The many miracles of bodily healing reported of the Cure of Ars were attributed by him to the intercession of St. Philomena. He said of her that she was his "dear little saint" his "agent in Heaven" and that she would do anything he asked. "And why not," he said, "For Almighty God Himself obeys me every day upon the altar." There seemed to be a Holy Alliance between St. Philomena and St. John Vianney. It is said that God gave her to him to be his helpmate of his labors and to stand by him so as to shelter his humility behind the brightness of her glory lest he should be terrified at the knowledge of his own power with God. There is a shrine at Ars to St. Philomena where the Cure of Ars and the pilgrims used to pray to her. Here at our Church, we now have a shrine where we too can pray for not only our spiritual and material needs, but also for signal graces for our Church and community to a saint that is known to be ALL POWERFUL WITH GOD. 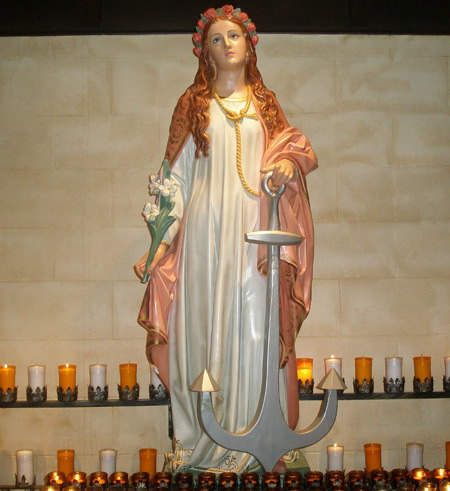 O Saint Philomena, Virgin and Martyr, Whom God glorifies by so many miracles, whom the Vicar of Jesus Christ has named the Protectress of The Living Rosary and the Children of Mary, manifest, more and more plainly from the heights of Heaven, that a voice holy as thine cannot be denied and that we have the right to rely upon thine aid. Obtain for us the grace to be faithful to Jesus Christ, even to death. "My dear Sister," the Saint revealed to her, "I was the daughter of the king of a small Grecian state. My mother too was of royal blood. As they had no children, my parents continually offered sacrifices and prayers to their false gods to obtain the blessing of a child. There was at that time with our family a Roman doctor named Publius, now a Saint in Heaven, though he did not suffer martyrdom. Touched by their blindness and moved by their sorrow, he was inspired by the Holy Ghost to speak to them of our faith and assured them that their prayers would be heard if they embraced the Christian Religion. His fervid eloquence touched their hearts, and their minds were at the same time enlightened by divine grace. After mature deliberation, they finally received the holy Sacrament of Baptism. "I was born at the beginning of the following year, on January 10th, and was called 'Lumena' or 'Light,' as I had been born in the light of the Faith, to which my parents were now ardently devoted. They gave me the name of 'Philomena' at Baptism, that is, "Friend of the Light" which illumined my soul by the grace of the Sacrament. Divine Providence permitted that the epitaph on my sarcophagus should be explained in this very sense, though the interpreters were not aware that it was the exact thought in the minds of those who had originally written it. "My parents lavished every affection on me, and my father could not bear to have me out of his sight. For this reason, I accompanied them to Rome at the close of my thirteenth year. This journey was undertaken in consequences of the declaration of war unjustly made on us by the proud and powerful Roman Emperor. Realizing his weakness, my poor father started for Rome in the hopes of making peace with the Emperor. My mother and myself went with him and were present at the audience he had with the tyrant. My parents agreed to his request, and on our return home sought to convince me that I should be, indeed, happy as Empress of Rome. I rejected the offer without a moment's hesitation and told them that I had made myself the spouse of Jesus Christ by a vow of chastity when I was eleven years old. "My father then endeavored to prove that a child of my age could not dispose of herself as she pleased and exerted all his authority to force me to obey. My Divine Spouse, however, gave me the necessary strength to stand by my resolution. "My father came for me, but seeing that my resolution was unshaken, both he and my mother, casting themselves at my feet, implored me to change my mind. 'O daughter!' they exclaimed, 'Have pity on your parents! Have pity on your country! Have pity on our Kingdom!' I answered that my virginity must take precedence of all else. "Nevertheless, we had to obey the Emperor and present ourselves at the Palace. At first he used promises and blandishments of all kinds to induce me to accept marriage, but all in vain. He then had recourse to threats, but with no better result. At last, in a fit of fury, inspired by the demon of impurity, he ordered me to be thrown into a dungeon beneath the Imperial Palace. Here I was bound hand and foot and loaded with chains in the hope of compelling me to agree to marry this man in whose soul the spirit of evil alone held sway. "Daily, the Emperor came in person to renew his attentions. He had the irons removed so that I could take a little bread and water, but seeing that his efforts were in vain, he would renew my torments. All this time, my Divine Spouse supported me. I recommended myself unceasingly to Jesus and to His Blessed Mother. "On hearing these words of comfort, my heart beat for joy." 'When leaving it,' continued the Blessed Mother of God, 'you will undergo cruel torture for the love of my Son.' " 'These new tidings filled me with fear, and I felt as it were all the bitter agony of dying.
" 'Courage, beloved daughter,' added the Queen of Heaven, 'beloved above all others, for you bear my name and the name of my Son. My Son, your Spouse, is called Light, Star, Sun. And am I not likewise called Dawn, Star, Moon, Sun? I will be your support. Now is the hour of human weakness and humiliation, but when the moment of trial arrives, you will receive strength and grace. These reassuring words restored my courage, and when the vision disappeared, a refreshing perfume remained in the dungeon. "The Emperor, despairing of inducing me to accede to his desires, had recourse to torture in order to terrify me and induce me to break my vow to Heaven. He ordered me to be tied to a pillar and scourged mercilessly, to the accompaniment of horrible blasphemies. "The tyrant, seeing that though I was one gaping wound, my determination was unaltered, ordered me to be brought back to prison to die in agony. I was looking forward to death to fly to the bosom of my Spouse when two bright angels appeared and poured a heavenly balm on my wounds. I was cured. The following morning the Emperor was astounded on hearing the news. Seeing me stronger and more beautiful than ever, he endeavored to persuade me that I owed this favor to Jupiter, who destined me for the imperial diadem. "The Holy Ghost inspiring me, I rejected his sophistry and resisted his caresses. Mad with rage, he gave orders that an iron anchor should be attached to my neck and that I should be thrown into the Tiber. But Jesus, to show His power and confound the false gods, once more sent His two angels to help me. They cut the cord, and the anchor fell to the bottom of the river, where it remained embedded in the mud. They then brought me back to the bank without a single drop of water having touched my garments. "This miracle converted several of the bystanders. Diocletian, more obstinately blind than Pharaoh, now declared that I must be a witch and ordered me to be pierced with arrows. Mortally wounded and on the point of death, I was once more cast into prison. Instead of death, which should naturally have been mine, the Almighty sent a peaceful sleep, after which I awoke more beautiful than before. On hearing this new miracle, the Emperor was so infuriated that he ordered the torture to be repeated until death should supervene, but the arrows refused to leave the bows. Diocletian insisted that this was the result of magic, and hoping that witchcraft would be unavailing against fire, he gave orders that the arrows should be heated red-hot in a fiery furnace. This precaution was of no avail. My Divine Spouse saved me from the torture by turning the arrows back on the archers, six of whom were killed. This last miracle brought about other conversions, and the people began to show serious signs of disaffection towards the Emperor and even reverence for our Holy Faith. "Fearing more serious consequences, the tyrant now ordered me to be beheaded. My soul, glorious and triumphant, ascended into Heaven, there to receive the crown of virginity which I had merited by so many victories. It was three o'clock in the afternoon of the 10th of August, which was a Friday. 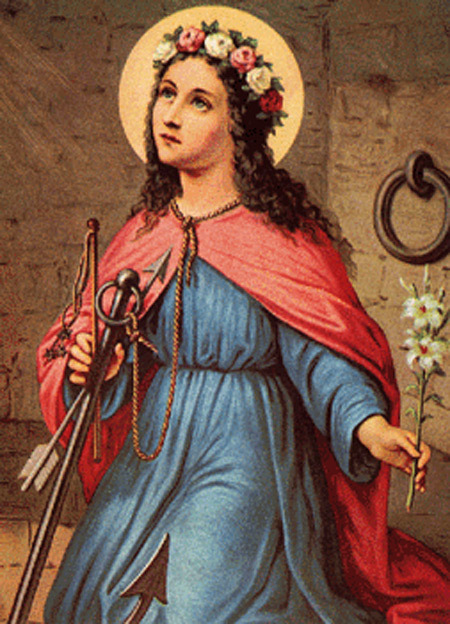 *St. Philomena's feast day was at first observed on August 10, but the Church changed it to August 11 out of respect for St. Lawrence, whose feast is August 10. Illustrious virgin and martyr, Saint Philomena, behold me prostrate before the throne whereupon it has pleased the Most Holy Trinity to place thee. Full of confidence in thy protection, I entreat thee to intercede for me with God, from the heights of Heaven deign to cast a glance upon thy humble client! Spouse of Christ, sustain me in suffering, fortify me in temptation, protect me in the dangers surrounding me, obtain for me the graces necessary to me, and in particular (Here specify your petition).